Hellgate Hunters & Anglers: Make a little noise! What does an early spring present look like? It looks like Congressman Steven LaTourette (R-OH). He’s just offered an amendment to fund the Land and Water Conservation Fund for $600 million per year, for five years. That’s huge. Now we need to send out a thanks to the Congressman, and a note to Congressman Denny Rehberg asking him to help make this amendment a reality. As many of youy have seen, LWCF has created new public lands, and public access to private lands throughout Montana. Places like Fish Creek, west of Missoula, the Marshall Block, near Seeley Lake, and the confluence of the Yaak and the Kootenia around Libby have all come to the public trust under LWCF. The City parks in our hometowns, and the fishing access sites we all use are funded by the Land and Water Conservation Fund. It's easy to see why this program has so much support: Increased access to public lands, increased recreation opportunity in our towns, and the funds come from off-shore leasing. In the last congress, $322 million was secured for the Land and Water Conservation Fund. A far cry from where we started, at almost $0. Let’s stand up for access, for large scale conservation, and support this amendment! 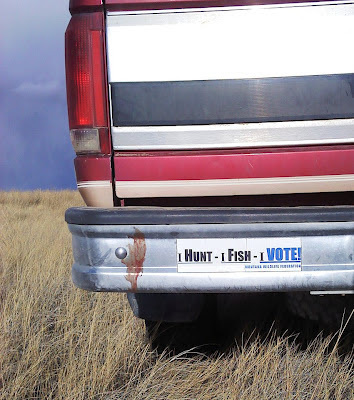 It's high time the hunters/anglers/conservationists get involved in the political process. Thank the politicians who vote for us and make accountable the ones who don't (that means don't vote for them again and tell them why) Get involved, stay involved, our very future depends on it.